That the Parliament notes the concerns that it considers are being expressed by growing numbers of Fife residents regarding the increased incidence of flaring at the facility operated by ExxonMobil Chemical Limited and Shell at Mossmorran, by Cowdenbeath, the most recent being between 23 and 25 March 2018; understands that data provided by SEPA shows that ExxonMobil has flared 165,861 tonnes of gas in 670 events between 2008 and 2016, while Shell has flared 21,162 tonnes in 753 events; further understands that the two major incidents in June and October 2017 are under investigation by SEPA with a view to possible enforcement action, and regrets the impact that it believes these episodes are having on the surrounding communities. I ask the public who are leaving the gallery to do so quietly. The next item of business is a members’ business debate on motion S5M-11398, in the name of Alex Rowley, on the impact of Mossmorran flaring. The debate will be concluded without any question being put. I begin by thanking those members who signed my motion to enable the debate to take place today and the Labour business manager for agreeing time for the debate. I was a teenager when planning was first sought for the Mossmorran petrochemical plant in Fife and when the work on the site first began. There was a view locally that many jobs would be created, not just in the construction of the site, but also because of the great boon for the local economy of the downstream work that would follow, as well as the spin-off opportunities for new industry in agriculture being fed from the site. It is true that the plant’s construction brought plenty of work and the local economy has benefited, but nothing like to the extent that was envisaged by those who were the strongest advocates of the plant in those early days. Throughout the years, concerns have continued to be expressed about the chemicals that come from the site into the air that we breathe locally. Over many years, I have worked with the former chair of the Cowdenbeath area committee, Councillor Willie Clarke, and have brought NHS Fife to the table to discuss the concerns. However, I believe that it is fair to say that, for much of that period, the community has not lived in fear about the safety of the plant itself—that is, until the past few years, when the episodes of unplanned flaring have increased at a pace that is causing major concern for the communities around the plant and much further afield. That is the key point that I want to make today and the key point that I have made in correspondence with the Cabinet Secretary for Environment, Climate Change and Land Reform. Most important of all, it is the key point that local people are making in growing numbers. We have lost confidence that the plant is safe. Why has the situation come about? Every time that there is an episode of unplanned flaring, that means that something has broken in the plant. Flaring is a safety mechanism when the plant is unable to run, so, when the flaring is unplanned, that means that something has gone wrong. I do not know how many members have witnessed the flare of Mossmorran. At night time, the pulsating orange glow illuminates the surrounding towns. 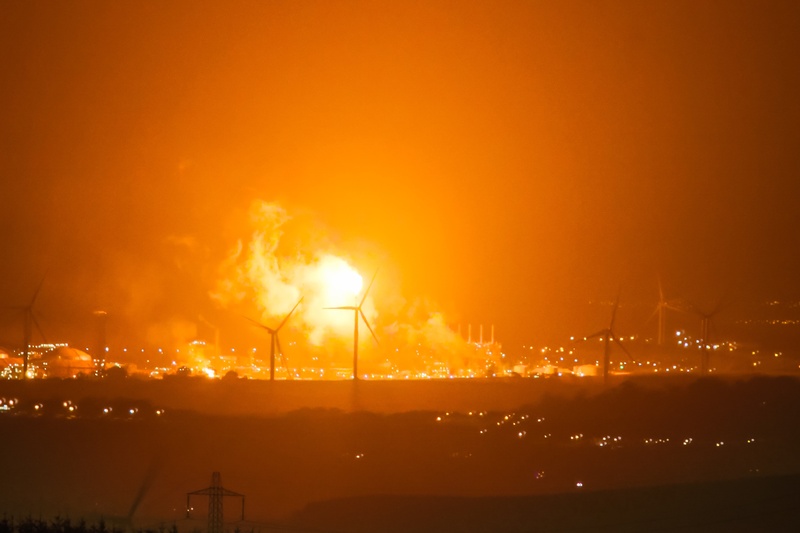 Ironically, a flaring incident took place during earth hour this year, lighting up the sky of Fife when, all round the world, people were turning off their lights to show solidarity with the aim of protecting our environment. I was told by someone driving past the plant during a flaring incident that they felt as if they were driving past Mordor. The issue is not just that the sky is lit up at night. The levels of vibration and noise are very frightening for residents. I refer members to the website of the Mossmorran action group, where they can read a summary of 169 issues reported by local residents. Those include vibration and humming; sleep disturbance; irritable throat, eyes and skin; breathing-related issues; excessive noise levels; headaches and migraines; chemical smells; stress and anxiety; pain and ringing in the ears; and soot and particulate matter. A lady from Lumphinnans contacted me yesterday when she saw in the local press that we were having the debate today. She wanted me to point out that the ornaments in her house visibly shake. A resident from Kelty recently described it to me as being like a helicopter landing in the back garden. Last June, on a beautiful sunny afternoon, I was in shock as I saw thick black smoke belch from the top of a stack and form a massive black cloud that sat over the top of the houses in Lochgelly, Glencraig, Crosshill, Lochore and Ballingry. It cannot be right, and it is not right, that people in those communities are having to go through those experiences and are now living in fear of the Mossmorran chemical plant that is on their doorstep. That is why I, along with many other politicians and local groups, have been demanding action. A final warning was issued by the Scottish Environment Protection Agency in relation to a flaring event that took place in June last year, yet, following that incident, there were unplanned flaring events in October, March and again in May. To be clear, those events are not short episodes of a few hours; they are usually continuous and last for days on end. It is simply not acceptable for people to have to put up with that for so long, with little being done to address the problem at its core. One of the key questions is: why does the plant keep breaking down? It is a 30-year-old plant, and we need to know what the issues are and how they can be addressed. The fact that breakdowns and therefore unplanned flaring events are increasing in number as the plant gets older must be addressed. That question must be answered by the operator of the plant, the public authorities and, ultimately, the Government. The people of Fife need the confidence that that is the case and confidence in the safety of their surroundings and the place in which they live. I thank Alex Rowley for bringing the motion to the chamber and for the opportunity to discuss the impact of Mossmorran flaring on our local communities. Mossmorran is one of Europe’s largest ethylene plants. The plant, which opened in 1986, was the first to be specifically designed to use natural gas liquids from the North Sea as feedstock. The Fife ethylene plant at Mossmorran is an extremely important asset to the community and the wider Fife area, and it is an asset to Scotland’s energy industry, as it has an annual capacity of 830,000 tonnes of ethylene and it contributes more than £20 million a year to the Scottish economy. Mossmorran is also one of Europe’s biggest and most modern ethylene plants, and it is among Fife’s largest employers, with 170 employees and 50 core contractors. Its highly skilled apprenticeship scheme has led to many ex-apprentices going on to join the workforce. More than 70 per cent of employees live within six miles of the plant, so the economic benefits that return to the local area from the highly skilled workforce at Mossmorran are obvious. I want to highlight Fife ethylene plant’s long-standing and extensive programme of community support and engagement, including sponsorship of the safe drive, stay alive roadshow, which is attended by more than 30,000 pupils; various theatre and lunch trips for some 1,000 senior citizens; and invaluable support for Energy Action Scotland. However, we are here today because of recent flaring incidents that have impacted greatly on local communities, the effects of which should not be underestimated and cannot be ignored. Although flaring is a vital feature that ensures the on-going safety of the plant, the noise, vibration and bright lights that are emitted during unplanned incidents—which have increased in frequency over the past year—have caused much alarm and distress among local residents. The light from the elevated flare can be seen for many miles from the plant. Fife ethylene plant seeks to minimise the occurrence of such incidents as much as possible, and it has set about making a series of improvements following the elevated flaring in June 2017. Improvements in maintenance processes, continued investment in new technology and research into improvements to the flaring system through the use of best technology have all been undertaken with a view to alleviating the issues of unplanned flaring. Regrettably, such problems will not be solved overnight, as recent further incidents have shown us. For that reason, I welcome the recent extensive discussions between local residents, politicians, environmental groups and regulators. I am pleased that there has been continued engagement from ExxonMobil and Shell, as the solution to the problems will be achieved only through true multipartnership working. Once again, I thank Alex Rowley for bringing the motion to the chamber and those who are involved in the efforts to reduce the impact of flaring incidents, including the Mossmorran action group, which I thank for rallying the local community together, organising extremely well-attended meetings, informing residents of developments, taking on their concerns and ensuring that the issues that are raised continue to have a high profile, thereby putting pressure on regulatory bodies to investigate. I thank SEPA and the Health and Safety Executive for their commitment to their joint investigation, and I thank the Mossmorran plant, whose apology to myself and the local community is very much appreciated. I am extremely pleased by the co-ordination of relevant stakeholders in responding to the incidents. Co-operation from all groups is crucial to mitigate the environmental and social impacts of unplanned flaring, as well as to prevent further incidences. The plant has had a consistently high health and safety and environmental performance, and a long-standing history of compliance. I am confident that by working together we can find a resolution to the problems. I am delighted to take part in the debate, and I congratulate Alex Rowley for allowing us the opportunity to have it. The Mossmorran community has lived alongside the plant for decades, but over the past three years, there seem to have been concerns that the safety of the plant is becoming more problematic. I was delighted to learn last week that the Mossmorran chemical plant is to have a top-level joint investigation by the Health and Safety Executive and SEPA. The inquiry was announced after SEPA had to issue a final warning to do with flaring that took place 12 months ago. At the time, SEPA described that as “preventable and unacceptable”. Obviously, residents within a huge radius of the complex are very distressed that that flaring lasted for nine days. As has been said, it sounds like a jet engine to those who live next to it. We understand that flaring is part of the plant’s safety programme, but many local residents have been kept awake and are very anxious about what is happening in their community. We have already heard from Alex Rowley about the noise, the pollution and the problems that individuals have to deal with. They are not able to sleep, and distress is caused to children and animals that live in the area. The plant’s monitoring is limited. The air quality in the surrounding area has been talked about in the past, and there is real concern because we have no real idea about what levels of carbon monoxide, carbon dioxide and other pollutants there are in the air adjacent to the plant when flaring takes place. More important, what are the short-term and long-term implications for people’s health? As one of the partners, NHS Fife has been actively involved in seeing what is happening in the community. There are concerns about that. SEPA has acknowledged that we have to work together to try to resolve that. We have already heard that there was flaring a year ago; other flarings took place in October and March. As I said, there has been a plant at the location for 33 years, and it has not broken down much. However, things have happened recently. As I have said, the flaring has to be considered. We have been told that a pump has caused some of the flaring over the past few months and in the past year. That is potentially down to maintenance of the plant, which is now being questioned. People are right to do that. Are the companies involved cutting corners? Questions are being asked. There have been public meetings. The plant did not even send representatives to the first public meeting that I went to. That absolutely enraged the community, and it was right to be enraged. ExxonMobil and Shell have worked in the community—that has already been talked about—but the action group, councillors, MSPs and MPs have got the issue up and running in the past few months. I give credit to everybody who has achieved that. Without that, people would be quite tight lipped about what was going on in the facility, so no one would be aware of what was going on. In conclusion, I say that I am delighted that SEPA is now carefully investigating the plant and that the Health and Safety Executive is taking more interest in it. The community deserves nothing less. The community has seen cross-party support, which will protect it in the future. That is what we are here to do: we are here to ensure that the community is protected. However, the community is fearful, and it is up to all of us to ensure that that is not the case and that we protect it in the future. I am pleased to take part in this important debate, and I thank Alex Rowley for bringing it to the chamber. I acknowledge the consistent interest that he and other members from around the chamber have taken in the issue over the years, and I recognise the work of former MSP Helen Eadie, who was elected to represent Cowdenbeath in 1999. We all still miss her. She worked hard, endeavouring to represent the concerns of her constituents about the ExxonMobil and Shell plant in Mossmorran, and in particular about unplanned flaring. I also recognise the work of local people, community councils and the action group in raising concerns and working with the operators, SEPA, Fife Council and other partners to try to address concerns. As the motion identifies, the past year has seen heightened concerns. I welcome the joint investigation by the Health and Safety Executive and SEPA following the recent unplanned flaring incidents at the plant. Those bodies have a crucial role to play. It is very concerning that SEPA has served final warnings on the operators, ExxonMobil and Shell, and has described prolonged flaring in June last year as “preventable and unacceptable”. In response to that, the HSE will be serving operating permit variations next week, which will require the companies to strengthen controls, which will have an impact on noise and vibration coming from any future flaring. Those measures have been long awaited by residents in the area, who have complained about the increased disruption that they have experienced from the site. Some people are saying that the noise levels, vibrations and light pollution keep them awake at night. Concerns have also been raised about the impact on health—in particular, on the health of people who have existing health conditions, including lung conditions and chronic illness that can be exacerbated by interrupted sleep and aggravation from air pollution. Communities withstood unplanned flaring in October last year, and in March and May this year, so I am pleased that the HSE and SEPA are saying that they will listen carefully to community calls for a root-and-branch review that will examine issues at the plant. It is important that the work that they undertake—the joint investigation between SEPA and the HSE and the review of operating permits—is robust and transparent so that the local community can rightly be informed about the flaring incidents in October, March and May. There is also still the potential for enforcement action in relation to those recent incidents, which remain under investigation. The recent joint meetings that were organised by Lesley Laird MP with key stakeholders, including many MSPs who are in the chamber this afternoon, local politicians, community groups and representatives from ExxonMobil, Shell and SEPA have been a positive development. The meetings have been an opportunity to discuss concerns about the plant, to make clear our concerns to operators and to work towards solutions. Alex Rowley covered many of the key issues, but there are a few areas that I would like to highlight. First, because it opened in 1985, there are issues to do with the age and condition of the plant, but that cannot be an excuse. In its final warning letter in April, SEPA said that failures in maintenance practices had led to extended periods of flaring. That is not good enough, so the plant must be brought up to a higher standard. In the recent meeting, Shell said that it is investigating what is the best available technology. That work must be prioritised. ExxonMobil said that it is preparing an action plan with a timescale for elevated flaring to end. That must be expedited. Those issues must be addressed if the plant is to have a future. Secondly, communication with the local community must be improved. Over the years, the plant has had a working group that involves community councils, but it needs to recognise that communication and engagement methods are changing and that there needs to be more proactive communication with the impacted communities. Thirdly, I recognise the level of compliance with applicable laws and regulations, but we must not be complacent and we must be vigilant and thorough, so I support calls for increased air quality monitoring in the area. I thank Alex Rowley for securing the debate. I also thank the Mossmorran action group, which has given a strong voice to communities who for decades have lived in the shadow of the plant. It is about time that we listened and acted, because over the years there has been a collective failure of Fife Council, SEPA and NHS Fife to fully recognise the suffering of communities and then to hold the operators to account. Why has it taken years for noise monitoring inside homes to be carried out? Why is it acceptable that families face sleepless nights, with only the cold comfort of the excuse that flaring is a safety measure? There has been no effective representative voice so far. It is all very well having a community liaison group handing out a bit of charity funding, but not if it is at the expense of proper scrutiny. The air pollution monitoring group’s remit is too narrow and has been hampered by lack of robust data. Anyway, air pollution is only one part of the problem: the multiple effects of vibration, noise, and light and air pollution are destroying people’s quality of life. I welcome the fact that, after our recent meeting, the Minister for Public Health and Sport has written to SEPA asking it to monitor vibration, noise and light pollution inside homes. There has at least been acknowledgement of the issue by SEPA. However, I am not impressed with the response from NHS Fife this week to my letter asking it to investigate the health impacts of flaring. It is passing the buck and claiming that it is not its responsibility, and that the sample size around Mossmorran is too small to investigate. Try telling families that are kept awake for days on end that their suffering is not statistically significant. I ask the Scottish Government to take leadership and to commission a body that can study the impacts. I am sure that there are many people living in the shadows of other plants in Scotland who could boost the sample size. In recent months, I have spoken to a number of former employees of the ExxonMobil side of the operation at Mossmorran. They have all told me of a corner-cutting culture at ExxonMobil that is stuck in the 1990s. However, a different approach seems to be in place at Shell, which goes beyond simple legal compliance. It is clear that the increase in flaring has happened because ExxonMobil will not shut the plant down for longer periods to allow for proper maintenance and investment. The company’s objective of keeping the plant running at all costs and at all times is leading to problems such as the tripping out of safety systems during maintenance, which leads to longer and more frequent flaring incidents. ExxonMobil is, in effect, externalising its maintenance shut-down costs on surrounding communities. Sleep is being stolen to pay for shareholder profit. I demand that, in their joint investigation of the plant, SEPA and HSE look at the critical issue of planned shut downs. Disruptive flaring can and should be minimised. If that requires a rebuild of the flaring infrastructure, the operators should see that as an investment in the plant’s future. SEPA must give communities confidence that a final warning is just that—it should do what it says on the tin. The operators must get the message that they cannot rack up environmental breaches as though they were parking tickets. Repeated breaches are not a simple operational cost to be absorbed: this is about consent, and communities do not give their consent to having their lives ruined. There needs to be action: Mossmorran needs to be shut for proper maintenance, or it needs to be forced to shut. I echo members’ thanks to Alex Rowley for securing the debate, and I thank the MSPs and MPs who have been assiduous in responding to people in the local community, many of whom remain concerned about what the future holds, as we have heard. Whether one lives in the immediate vicinity of Mossmorran, in other areas of Fife or Kinross-shire or across the water in Edinburgh, Mossmorran is well recognised as the very large, gaseous ball of orange in the sky—or, sometimes, heavy black smoke, as Alex Rowley said. It is an alarming sight at times, and, notwithstanding the recent announcement of a joint investigation by SEPA and the Health and Safety Executive, it remains the principal focus of concern for many communities in the area. Several members who have spoken in the debate have more experience than I have of the recent public meetings. The majority of the constituents who have written to me have cited transparency as the main issue. They want to know the details of the ageing plant. They especially want to know whether there are fundamental failings in the plant’s structure; why the pump failed; what tests have been undertaken with regard to air pollution and health risks and what the results were; and who knew what and when in terms of decision making. Those are perfectly understandable and legitimate questions. For example, when SEPA says that an unplanned flaring incident was preventable, we need to know exactly what evidence supports that view, why the two companies were unable to deal satisfactorily with the concern at the time and why, since then, it appears to have taken considerable time for more facts to emerge. That obfuscation has served only to heighten tensions. Moreover, the noise and air pollution that members have talked about, as well as the arrival, on occasions, of several emergency vehicles, give local people little cause for comfort. Therefore, for me, full transparency is the priority. We need that as soon as possible. We need not only an independent and comprehensive investigation into what has gone wrong in the past but safety assurances about the present and especially about the future. I have no doubt that there is a delicate balance to be struck between ensuring that there is a safe production environment and ensuring that Mossmorran’s position as Europe’s largest ethylene plant can be maintained and enhanced, not least because it is important in supporting the delivery of the maximum potential of the North Sea’s resources, which is where the tensions have been in recent months. There have not always been clear lines of responsibility or—just as important—clear lines of accountability. Although both ExxonMobil and Shell claim that they are working hard in that regard, including by providing daily updates, there still appears to be mistrust within the local community. Addressing that is perhaps the most important priority, and I think that that will come down to the provision of clarity over legal responsibilities and exactly what obligations the two companies have in the context of SEPA’s final warning. SEPA seems content that the new operating permit variations that will be served on ExxonMobil and Shell will be the necessary means of enforcing renewed legal obligations on the two companies. That is good, but there remains the statement from both companies that they believe that they already comply with the legal requirements. Of course, that raises the question of what would happen and who would be proven correct should the matter be taken to the courts. This is a deeply worrying issue for the whole of the local community, not just because of the safety concerns but because, hitherto, the relevant answers have not all been forthcoming. That must change, and I hope that this debate will assist. I thank Alex Rowley for initiating this debate on a matter that I know has been of significant concern to local residents and to the constituency MSP, Annabelle Ewing. I also acknowledge Claire Baker’s mention of Helen Eadie. I was the convener of the Health Committee between 2003 and 2007, when Helen Eadie was a member of that committee. I assure those members who might not have been here at that time that Helen was an absolute terrier when she took up an issue and Parliament is the poorer for her absence. A number of other members highlighted specific areas of concern in connection with this particular topic. Alex Rowley rightly highlighted the concerns and fears of residents. I recognise the significant impact that incidents such as these can have on people’s quality of life. The level of disruption that people have experienced is simply not acceptable—it is important to acknowledge that from the outset. Mossmorran is, of course, one of Scotland’s largest and most important industrial sites. It makes a significant contribution to the economy, but it is important that it does so in a way that is sustainable and that minimises the potential for adverse impacts on the local community and the environment more generally. The site is regulated under the Pollution Prevention and Control (Scotland) Regulations 2012, which means that the plant requires a permit to operate, and that permit sets strict controls on a whole range of environmental issues. Regulation of such sites is a matter for SEPA, the independent regulator that grants and varies permits on the basis of expert analysis and guidance. I am reassured by the strong and consistent message coming from SEPA that compliance with permit conditions is an absolute requirement, not simply an option. As Alex Rowley flagged up, SEPA issued final warning letters earlier this year. SEPA has committed to reviewing the permits of ExxonMobil and Shell at the Mossmorran complex, and permit variations are due to be served on both operators today. Analysis of the information that was gathered during recent flaring events will be considered by SEPA when it decides what course of action to take. It would not be appropriate for me to prejudge what enforcement action SEPA should take, but it is reasonable for residents to expect SEPA to take effective action to address non-compliance when it occurs. I am aware that the SEPA chief executive, Terry A’Hearn, met local partners last week to set out, face to face, the action that SEPA is taking, and I know that that was a welcome development. That action includes launching a joint investigation with the Health and Safety Executive into the issues that have arisen at the plant, which will allow for co-ordinated action to address the causes of the flaring problem. Mark Ruskell mentioned the recent meeting that he had with Aileen Campbell, the Minister for Public Health and Sport, to address specific concerns about the public health impacts of flaring. The minister has subsequently written to SEPA’s chief executive, asking for further information on the work that is being done to assess the public health issues. A previous independent modelling study that was carried out on behalf of SEPA assessed the impact of emissions during flaring and concluded that the long-term and short-term predicted concentrations of pollutants were well within air quality standards for the protection of human health. However, I appreciate that noise and vibration issues remain of particular concern to local residents. As I said, the Minister for Public Health and Sport has now written to SEPA, seeking reassurance on those public health issues. Today has shown the gravity that the Scottish Parliament attaches to environmental performance at industrial sites. I emphasise to members that the Scottish Government has set a strict framework for the regulation of industrial sites and takes the recent situation at Mossmorran extremely seriously. Parliament can be assured that we will continue to work closely with SEPA to understand the steps that it is taking to ensure compliance at the site and to address the concerns of local residents.